Buy Minas Tirith on Amazon or find The One Ring supplements on RPGNow. You too can earn money from writing articles by signing up for InfoBarrel. Minas Tirith by Graham Staplehurst is a role playing game supplement published by Iron Crown Enterprises (I.C.E.) and is the first book in the Cities of Middle-earth series. It is designed for use with I.C.E. 's Middle-earth Role Playing (MERP), set in the world of J.R.R. Tolkien's Lord of the Rings, and is also compatible with their Rolemaster role playing game, MERP being a slimmed down version of Rolemaster. The book primarily used the appendices of The Lord of the Rings as reference material, but also used background from other books such as The Silmarillion, The Hobbit and Unfinished Tales. The book was published in two editions. The first, in hardback, is a 160 page book and the one reviewed, and was released for the first edition of MERP. It was also published in softback with the second edition of MERP. The hardback has a full colour cover, black and white illustrations and maps inside, and a separate double sided colour map of approximately A2 size. Credit: Iron Crown EnterprisesMinas Tirith is set in the year 1640 of the Third Age, as are most MERP supplements, whilst the War of the Ring - the focus of The Lord of the Rings - takes place mostly in 3018-9 of the same era. As a consequence of this, this supplement, despite its name, doesn't actually detail Minas Tirith, the Tower of Guard, as it was known during the war, but, instead, it covers Minas Anor, the Tower of the Sun, as it was formerly known until T.A. 2002 and the fall of Minas Ithil. The supplement does have the majority of time specific references removed, but it is still mostly well prior to the resurgence of Sauron. The events of The Hobbit took place primarily in T.A. 2941-2. Middle-earth is considered to be a high fantasy setting, but there are very few in the way of traditional fantasy spell users - primarily the wizards such as Gandalf, Radagast and Saruman, who aren't actually human - with most magic present being in the form of enchanted items. This does create problems when trying to work the setting into a fantasy role playing game, as player spell users are a traditional part of such settings. As a result, there are fewer spell users in Minas Tirith than might be seen in other high fantasy settings, but more than are present in the source material. In 1640, Gondor is past its peak (and the northern kingdom of Arnor is no more, with only one of the three separate successor states still a viable realm), although Minas Anor has just become the new capital city and is entering a new era of prosperity. The city hasn't declined to the level it was during the War of the Ring. An Introduction to Minas Tirith is a brief introduction to the city, the Cities of Middle Earth series and the time in which this supplement is set. City of the Sun is a brief history of Middle-earth, in particular as it related to Minas Tirith. Credit: Iron Crown Enterprises/eGDC LtdThe City Lands covers the various nearby regions that fall under the city's purview. Flora and Fauna covers plants and creatures in the region, including some details on herbalism. Culture and Lifestyles is the dress and habits of the dwellers in Minas Tirith. Commerce briefly covers currency and exchange rates. The Inhabitants gives details of the people who reside in and run the city, and what various organisations do. Politics and Power covers government and some other societies and organisations. City Overview is a description of the construction of the city, including such things as the walls and streets. Buildings of Note describes some of the buildings in the city in more detail, with accompanying floorplans for the majority of them. Credit: Iron Crown Enterprises/eGDC LtdThe City in Other Times is a brief section covering using Minas Tirith in the earlier Kin Strife, later during the War of the Ring and in the Fourth Age after the events of The Lord of the Rings, when Aragorn is ruling as King Elessar. People of Note is the major important non player characters that can be encountered in Minas Tirith. There are many others of lesser importance scattered throughout the rest of the book. 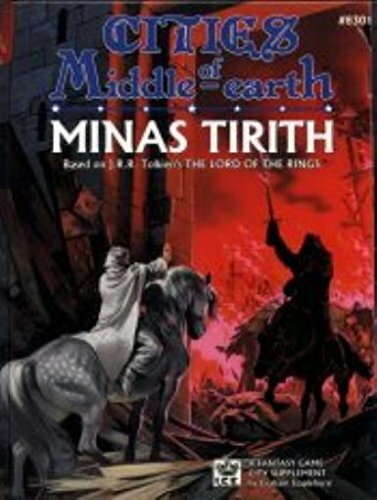 The section called Adventures contains a selection of short adventures based in Minas Tirith. Adapting this Module covers using Minas Tirith with other game systems to Rolemaster and MERP, primarily Advanced Dungeons & Dragons, as that was the major RPG system available at that time. Tables has the various stats of the NPCs throughout the book as well as an encounter table for the city. The final section, the Appendix covers the terminology and abbreviations used in the books, in both cases covering Middle-earth specific terms as well as more general ones, including those related to the MERP and Rolemaster game systems. Credit: Iron Crown Enterprises/eGDC LtdThe accompanying, separate, map has, on one side, a colour and marked map of the city, and, on the other, the surrounding area of Middle-earth, which is divided into two adjoining sections. Despite being a more magical setting than Tolkien's Middle-earth, as this is generally preferred by players in a fantasy setting, the book manages to capture the tone of Middle-earth quite well. The book has extensive details, and descriptions, of the buildings that are covered, including floor plans of many of them. There are also a number of small, unmarked floor plans interspersed in the text, which can be fleshed out if desired. These floor plans are simply labelled with the type of building they show. Credit: Iron Crown Enterprises/eGDC LtdT.A. 1640 may seem an odd time to play in Middle-earth, as it is set well before the events of both The Hobbit and The Lord of the Rings. These books are a rather fixed series of events, though, which provide little scope for player's to really affect, and much of Middle-earth was now wilderness, following the collapse of the northern realm of Arnor (and its successor states) and the southern realm of Gondor was much smaller and more stagnant. Admittedly, the wild aspects of much of the region does, in some ways, provide a better prospect for adventuring than during more civilised times. The city being set in this time period will probably put at least some people off it, especially those who are only really familiar with the time period of The Hobbit and The Lord of the Rings. I.C.E. lost the license to Middle-earth in 1999, so Minas Tirith will never be published in PDF, and the only way of getting hold of it is by purchasing an existing edition. Currently, the Middle-earth license is possessed by Cubicle 7, who publish The One Ring, although Decipher Inc. still has the right to publish some material. Minas Tirith is an interesting citybook to pick up, and will be useful to those who are still running, or plan to run, a campaign in I.C.E. 's Middle-earth.